7'2" Medium-Heavy Action, Moderate-Fast Tip. 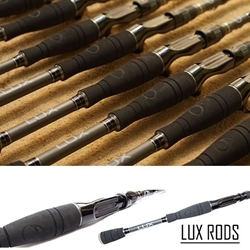 6th Sense Fishing Lux (Latin for light) rods are an engineered balance of weight, strength, and action that provide you, the angler, with the same rewarding experience as driving a luxury sports car – we are confident you will agree. Each of the 13 Lux models utilizes high modulus Japanese IM7 graphite blanks with multi-layer carbon cloth that optimizes performance in all fishing applications. The medium sized guides are the ideal diameter and manufactured with premium stainless-steel inserts. Utilizing superior components including an ultra-light reel seat, EVA split grip handles, and a premium hook keeper design, each rod combines to provide a uniquely sensitive, lightweight feel for all-day comfort on the water.